Our goal is to support students becoming all that God wants them to be within a strong pastoral care context. Parklands Christian College offers an academic program that aims to provide students with appropriate Biblically based Foundations for Life and unashamedly invites students, parents and the wider college community to pursue an active and genuine relationship with Christ. Parklands Christian College endorses The Melbourne Declaration on Educational Goals for Young Australians which sets the direction for Australian schooling for the next 10 years. The Australian Curriculum sets out the core knowledge, understanding, skills and general capabilities important for all Australian students. The Australian Curriculum describes the learning entitlement of students as a foundation for their future learning, growth and active participation in the Australian community. It makes clear what all young Australians should learn as they progress through schooling. It is the foundation for high quality teaching to meet the needs of all Australian students. Parklands Christian College eagerly supports the implementation of the Australian Curriculum. 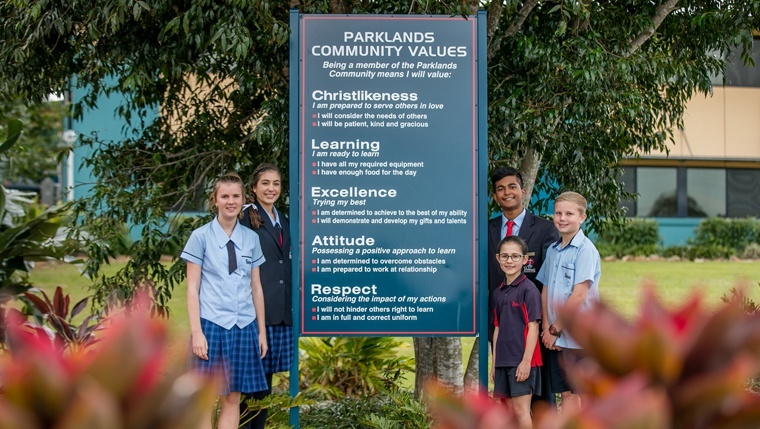 Parklands Christian College is a non-denominational school, but affirming all faithful Christian expressions and committed to teaching and living out the truths of traditional Christianity. The College has a Statement of Faith as part of its legal basis in its constitution. The following is an expression in plain english of what that statement contains, written to show how it relates to our educational goals. That the Bible (the Old Testament and the New Testament) written by men, but inspired by God, is essential for obtaining true wisdom. Children will be encouraged to read and study the Bible. That God has always existed, and has revealed Himself to us in what has been known for centuries as the Trinity: God the Father, God the Son (Jesus Christ), and God the Holy Spirit. He created the world and mankind, indeed the entire universe, and we teach children that as his created beings, we have an obligation to worship Him and Serve Him. We teach that it is our privilege as human beings to be able to communicate with God, by what we call prayer. That every human being needs to come to God to receive forgiveness for his or her sins, and that this forgiveness is freely offered by God because of His love for us. This is the Gospel, the Good News of God to mankind. We are able to be freely forgiven because of the death of Jesus on our behalf, regardless of who we are or what we have done, and we are able to receive new life, because of His resurrection. Only if we accept that forgiveness, and agree to name Him as our Lord and Saviour, can we look forward with certainty to eternal life in Heaven with Him. There is only one other alternative: that we will spend eternity outside of God’s presence. We encourage children to accept God’s forgiveness, but they are always free to make their own decisions without coercion. That the worldwide body – past, present and future – of those who put their trust in God’s fit of eternal life through Jesus, regardless of what Church they attend or what race or ethnic origin they are, are enabled by His Holy Spirit to live lives that will honour God and reflect Jesus’ teaching. As a school community, we do not require families to attend church, however, we do require support from all parents in teaching your children our Christian Values.